Starting with Goodbye begins with loss and ends with love, as a midlife daughter rediscovers her enigmatic father after his death. Lisa has little time for grief, but when her dead dad drops in for “conversations,” his absent presence invites Lisa to examine why the parent she had turned away from in life now holds her spellbound. Lisa reconsiders the affluent upbringing he financed (filled with horses, lavish vacations, bulging closets), and the emotional distance that grew when he retired to Las Vegas and she remained in New Jersey where she and her husband earn moderate incomes. She also confronts death rituals, navigates new family dynamics, while living both in memory and the unfolding moment. In this brutally honest yet compelling portrayal and tribute, Lisa searches for meaning, reconciling the Italian-American father—self-made textile manufacturer who liked newspapers, smoking, Las Vegas craps tables, and solitude—with the complex man she discovers influenced everything, from career choice to spouse. By forging a new father-daughter “relationship,” grief is transformed to hopeful life-affirming redemption. In poignant, often lyrical prose, this powerful, honest book proves that when we dare to love the parent who challenged us most, it’s never too late. Lisa Romeo is part of the founding faculty in the Bay Path University MFA program, and works as a manuscript editor and consultant. Her nonfiction is among Notables in Best American Essays 2016, and is published widely in literary and popular media, including the New York Times, O The Oprah Magazine, Under the Sun, Brevity, Hippocampus, and more. Lisa is a former equestrian journalist, competitive rider, and public relations specialist. She lives in New Jersey with her husband and sons. "Romeo’s honest, hopeful story will strike a meaningful chord with those who’ve been prompted to reconsider their relationships or themselves after a death." This memoir spans but a few years in Ms. Romeo's late forties, though of course looks back. Her elderly father, living comfortably in Las Vegas with her mother, falls ill. He develops disabling arthritis, Alzheimer's, and then has a stroke. Getting old, as has been said, is not for the faint of heart… Grief, as the author tells us, is not about forgetting. It is about remembering. The treatment for grief, particularly persistent or unresolved grief, is conjuring up memories, unearthing the past, with its kaleidoscope of emotions. Only then can the heartache be mitigated, a lost and pained relationship be mended, a life propelled forward. That is where this memoir ends. Not quite "all's well that ends well." The author knows life too well for that. But her grief and her father's visits (which fade and then maybe vanish for her) are mutative. She has changed in ways that heighten her attachments and her kindness to others and herself. As her father used to say, "you did good, kid." "Romeo’s reflections on death and complicated parental relationships gesture towards a larger understanding with which any human can empathize." "Lisa Romeo has constructed a provocative look at the grieving process, unstinting in self-examination, authentic in its exploration of complex family relationships, and, at its most basic level, a tender eulogy about the father she has lost." "She opens up her heart to her father, her family, the reader and herself. She writes that the act of creating this memoir was, in part, to know her father better. In doing so, it’s clear to readers that she has also come to know herself better. And this is a story any of us having experienced loss can take comfort in." 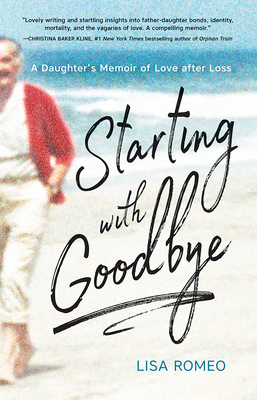 "Starting with Goodbye produces the fading image of a whole generation of Italian American old timers, loaf of Italian bread in hand, skillfully playing on the reader’s heart strings."